Three separate candidates are vying for the Republican nomination in Senate District 5 in Laramie County! And as a gun owner, you need to know that these three candidates have very different views on how much Second Amendment freedom you and I should have! One candidate has stood up for gun owners with a 100% pro-gun score on the WYGO candidate survey. Another candidate has promised that he would SUPPORT ‘Red Flag Gun Seizures’ if elected, a shocking admission. And Fred Emerich, the incumbent, has been opposing your gun rights going all the way back to 2011 and is refusing to sign the Wyoming Gun Owners 2018 Questionnaire! Two of these candidates are doing all they can to hide their views, while one is proudly standing up for your gun rights! 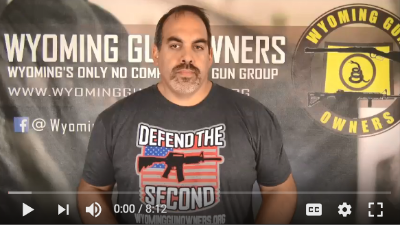 And that’s why WYGO has produced this video update for gun owners in Senate District number 5, so that you can have all the facts! Watch it here! P.S. Gun owners in Senate District 5: Fred Emerich is trying to run away from his record of voting against your gun rights! Another candidate, Ryan Wright, also intends to back radical gun control if given a chance to do so. One candidate, Lynn Hutchings, has promised to back the Second Amendment 100% of the time!